WOW! Fantastic opportunity for investors or home owners looking for extra income! 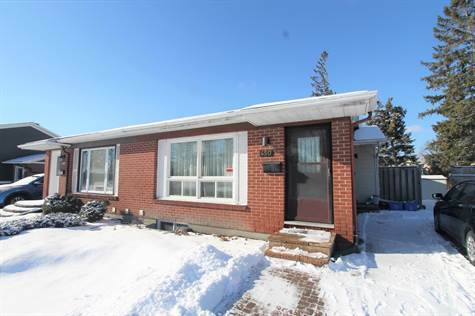 This semi-detached bungalow boasts a LEGAL secondary dwelling in the lower level – rare to find in the area. The main level features three spacious bedrooms, hardwood floors, spacious kitchen with eating area, and great living room space that is flooded with sunlight. The lower level features two bedrooms (one with a walk-in closet! ), updated kitchen and bathroom with modern finishes, and extra storage space. Laundry is shared between the two units and Landlord is paying for all utilities (1 meter.) Located in the popular Tanglewood neighbourhood – you can live steps away from parks, greenspace, and shops + easy access to public transit and Algonquin College. Set on a fully fenced large lot, you can enjoy your own private, green backyard this summer! Windows '17. Furnace '12. AC '15. Roof '13. Main level rented at $1,350/m. Lower level rented at $1,300/m. Total rental income $2,650/m!